All Insects, though essential for human life, are a nuisance to most people, especially when they are in their homes. More often than not, these bugs bring germs with them, especially the fly. Certainly, you can treat this problem using various commercial products or insecticides, but they are chemicals which you may not wish to use. Regular pest management is extremely important to ensure that your home is completely safe at all times. Many different types of pests infest our homes and surroundings, and house flies are one of the most common and troublesome ones. They can become a nuisance in your kitchen, attic( loft ), bathroom, bedrooms or conservatory where you maybe have house plants. These tiny little insects are found almost everywhere in the world where human beings live. They are extremely annoying to have around because they keep buzzing around people, and especially around their food which flies are attracted to. What’s even worse is that these creatures are responsible for the spread of many diseases. Since they spend a lot of time at garbage dumps and sewage, they are known to pick up disease-bearing microorganisms and transfer them to food items. 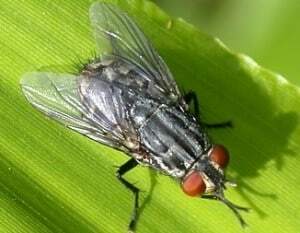 If you have lots of these flies at home, then it reflects very badly on your standards of hygiene. You, therefore, need to ensure that you get rid of flies in the house. Your pest management efforts ought to focus on controlling the larvae rather than on the adult flies because the former are easier to kill fast. Symptoms: unexpected episodes of watery diarrhea that contains flecks of white mucous material, stomach pains,sticky mouth, sunken eyes, concentrated colored urine, dry skin, nausea and vomiting (usually). Treatment:Cases can vary from mild to serious. If untreated, serious cases can lead to imminent death. Drink plenty of fresh water, mixed with small quantities of salt and sugar. This will restore the body’s fluid. Treatment must be given immediately. Symptoms: It depends on Escherichia-coli. Most strains are harm-less and results in no detectable symptoms. Other strains, such as O157: H7 can cause blood diarrhea. In a few of cases Escherichia coli O157: H7 can lead to a hemolytic uremic syndrome that can lead to kidney failure in young children. Symptoms: Diarrhoea (often bloody), fever, and stomach pains. Most cases are mild and may not even be noticed. In a few cases, the very young and very old may be vulnerable to high-temperature fever, possibly (and rarely) leading to a seizure in a toddler. Getting rid of flies in and around the home is possible, using many different methods including homemade fly traps, essential oils, apple cider vinegar and many others. Here are some great ideas for dealing with your fly infestation. Put a mixture of molasses and black pepper in a small dish or a disposable plate then place the dish outside. Make sure that you place the dish away from where you wish to spend time. The scent of the mixture will attract flies and due to the stickiness of molasses, the flies will get stuck in the dish. Afterward, just dispose of the dish. It’s that simple! Certain herbs can easily help you eliminate flies once and for all. Such herbs include lavender oil, peppermint, and elder. You may want to use then to decorate your interior space or plant them in the garden to get rid of flies in the exterior environment. You can also use these fly repelling tricks in essential oil format and can be equally effective. In most circumstances, house flies reside and breed in the trash cans. You should destroy their homes by sprinkling borax at the bottom of your trash can. This will prevent the flies from breeding and deter them completely. Flies are a common problem during summer and in sunny areas, but it is possible to see a few of them in winter too, especially if it doesn’t often get below freezing where you live. If you live in such a locality, and the area is infested by flies, using potted basil plants may prove to be helpful. 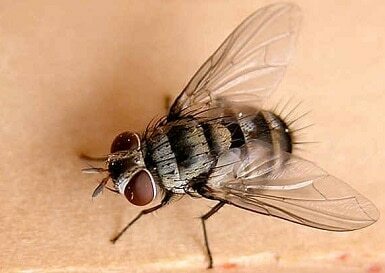 Its effect on flies can be attributed to its scent which irritates the creatures, driving them away from your space. It’s important that you water your basil plants at the roots. This allows the leaves to produce a stronger and much effective scent. You may also want to hang a fly paper or commercial traps in areas where the flies congregate. This might be the kitchen or the garage. Additionally, don’t give up on the fly swatter or fly zapper. It can come in handy if the flies are stubborn and you need to kill them. Many people don’t know how the water bag trick deters flies, but it works. Place a penny inside a Ziploc bag and fill it with water (half full) and then hang it in an area where the flies frequent. Exterminators are of the opinion that flies have poor sight and often see the bag as a wasp’s nest or a spider web. This will undoubtedly scare them away and one DIY way of treating the problem without killing them. When you keep your kitchen nice and clean, the drain flies will have nothing to be attracted to and is obviously the best form of pest control. They love the smell of fruits and vegetables, especially rotten fruit, orange peels, smells from the sink and items that are going bad. This is especially important in the summer months with warm weather. Get rid of everything that might attract the flies, especially any organic materials. If you want to keep them away, just make sure that your kitchen is nice and clean. Use a disinfectant to wipe down the counters every night, and immediately clean up any spills. Take time to empty food out of the drain trap in your kitchen, and make sure that your garbage can lid is clean. Also it is known that flies hate the smell of dish soap, so by mixing some with warm water and washing down your kitchen surfaces, it can only help keep away house flies. If you leave fruit in a bowl, the flies are going to be attracted to it. It’s a good idea to put the fruit in a bowl that you can cover with a lid, as the flies will have no way to get at the fruit. Ensure that your garbage can is properly closed, and stow all the leftover food in the fridge. Close the pantry doors, and be certain that there is no food left out in the open air. For those that are sick and tired of the fruit flies, vinegar makes a handy homemade fly trap. Pour a cup of apple cider vinegar in a cup of water which is warm, and pour in a couple of teas-poons of dish soap – preferably a citrus scented soap. Leave this out near the fruit, and watch the flies flock to it. The vinegar and soap will drown them, thus eliminating them effectively. To give way for the insects to get into the jar poke holes in the wrap. The insects will swarm around it and be attracted by the scent of vinegar and get into the jar. Most of them won’t be able to find their way out thus will die inside the jar. This vinegar home remedy loses its effectiveness after sometime; therefore, you have to keep on replacing it after a day or two. Beer makes a very good trap for fruit flies, and you can pour a couple of cups of beer into a simple mason jar as the trap. Cover the lid with a piece of saran wrap, and secure it in place with a rubber band. Poke some holes in the top so the flies can smell the beer, and they will cluster and fly into the fly trap. Once they drink the beer, they will be unable to get out. If you check later in the day you will see a bunch of them at the bottom of the trap. If you want to make your traps as effective as possible, you will do well to leave the lights on in the kitchen overnight. Fruit flies tend to be more active when there is light out, so leaving the lights on in the kitchen will attract them. They will be more likely to fall into your traps, as they will fly around looking for the fruit. Coke is full of sugar, which is just what the fruit flies are looking for. Pour some Coke into a soda bottle and screw the top on securely. Use a nail to poke a hole in the upper of the bottle, and leave it out where the flies can smell it. They will be attracted to the soda, and they will swarm around it and fly into the bottle to drink. They will be trapped inside the bottle, where they will drown eventually. Possibilities are good that the flies are attracted to the smell of the garbage in your garbage bin, especially if your bin uses a revolving top rather than a lid. It’s best to take out the garbage at least once a day during the summer when the fruit flies are more active, and make sure that your garbage can lid is cleaned regularly to avoid fruit flies. In addition to killing the flying insects you also need to get rid of the eggs. To kill the eggs you only need to find where the insects are breeding. When looking for breeding areas remember that the insects breed in areas that provide them with food and moisture. These areas include garbage cans, dank sinks, and rotting fruits. To kill the eggs you need to destroy these areas. If they are breeding in garbage cans, you should clean them. Also, dispose of the rotting fruits in your house. If the flies are in the kitchen, thoroughly clean it and dispose of the materials that you use in cleaning. These include old rags, damp mops and old sponges. Prevention is the better option than cure, preventing an infestation starts with all the above methods by determining the kind of flies invading your home, which will need you to know their breeding cycles, diet, and favorite habitats. Fumigation brings a more drastic approach to dealing with flies; it is more of chemical warfare. In the simplest form, fumigation is the introduction of a noxious substance in the air that is lethal to flies with the aim of killing any fly that breath in the air. If you are not able to control the fly menace at your home, you should get a professional pest management company involved. The company will ensure that these nuisance insects are kept under control. This will help you and your loved ones stay safe from a whole lot of diseases such as diarrhea, cholera, food poisoning, dysentery, and even eye infections. The money you spend on pest control will help you save a lot more money on hospital bills. The International Network is the best option to search the best flies control service provider company. These days almost all service providers have their websites, so you can visit their websites and gather all the information that is required. You can check the range of services they offer, the techniques they use and also get information about the experience and qualification of people working there. A good such service provider will always make sure that once you have taken their services, your premises will always be free of flies so that you can live safely and securely in a healthy environment. An effective fly control service from will give a lot of importance to safety. They will perform all the tasks by the health and safety requirement as set out by the current legislation. Hence choose a profession flies control firm get rid of flies completely from your home.